Spring, a season everyone looks forward to every year. Months of cold miserable dark days and wintry snow gives way to some bring sunny rays and longer days. If we can just tear ourselves away from the potential April shower for a moment and just look on the bright side. Spring brings forth hopes and multitude of possibilities - walk in the park, strolling along River Thames and stunning blossoms. But for me, nothing excites me more than the promise of a couple of months of one of my greatest indulgences around this time of the year - wild garlic also know as ramsons, ramps etc. Unlike their distant cousin whose characteristic potent odour that is so strong that consuming them before date night almost certainly makes you a one date wonder. If smells could kill, your breath will be the ultimate weapon. 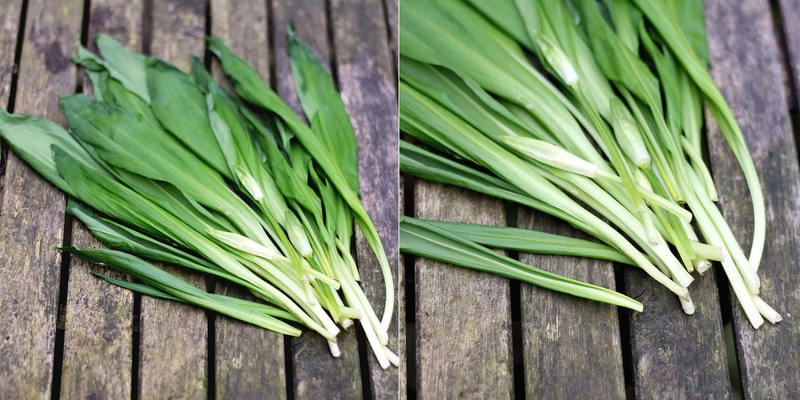 Wild garlic has a similar but milder aroma compared to the normal garlic. However, eating them before going on your date is still at your own peril. 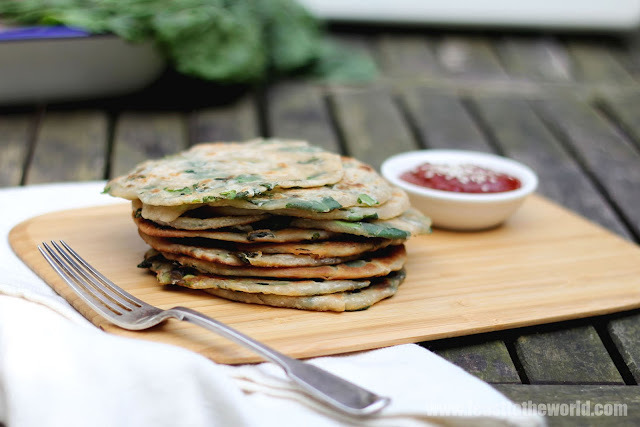 I love wild garlic and I like to make full use of them as much as I can whenever they are around. They are excellent to zing up a normal aioli, turning them into fine accompaniment to some roasted English asparagus, another Spring's favourite. They are also really good as a simple pasta sauce (see my linguine with wild garlic and lemon) and when cooked, their pungent aroma mellowed slightly. And I've also made a simple stuffing for some deep-fried tempura flowering courgettes with great success. As I'm not a seasoned forager and have absolutely no idea where to begin looking for this wildly available nature's treats in the woods, I therefore had to resort to buying them from the farmer's market. 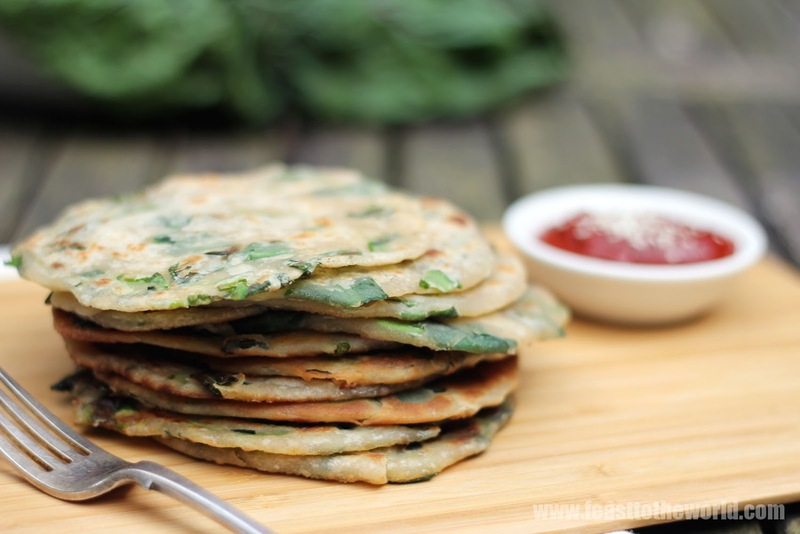 I've used up half of them to make my clams, chorizo and beans brothy dish the other day so I thought I will be frugal and used up the rest to make a Chinese classic spring onion pancakes. 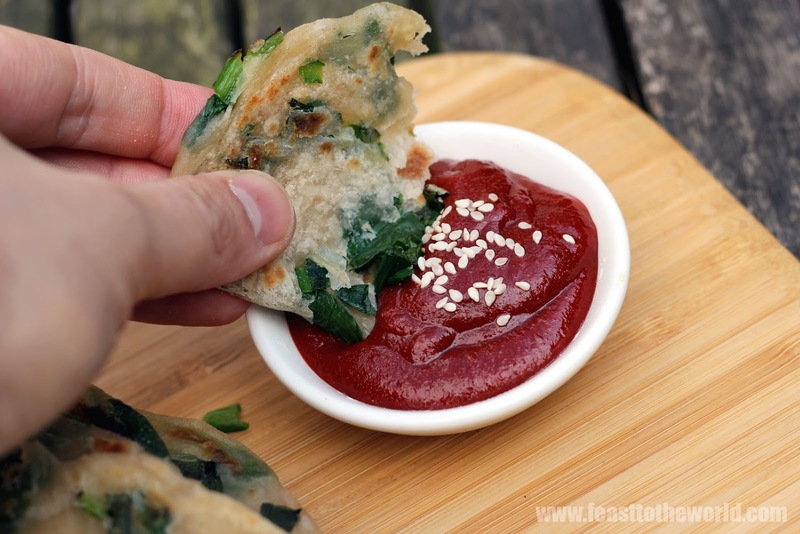 This northern China's speciality have been give a modern twist by replacing the spring onion with the garlicky greens and I have also made a piquant and sweet Gochujang dipping sauce to go with it. And I tell you what, they are superb and very moreish. Very good indeed. My plan is to be able to sniff these out in the wilderness myself some day. Do drop me a line if you have any suggestion or tips on where is the best place to start here in London. Who knows, my next post featuring any wild garlic might just be a foraged acquisition. Fingers crossed. To make the Gochujang dipping sauce, mix the gochujang, cider vinegar, mirin and sugar to combine and topped with the sesame seeds. Set aside. Place the flour and salt in a large mixing bowl. Add the oil and water and mix well using a wooden spoon or spatula to a soft sticky dough. Turn out onto a lightly floured working surface and knead for 8-10 minutes, until smooth and elastic. Add more flour if it start to get to sticky. Cover with a clean kitchen towel and rest for 20 minutes. Lightly dust the working surface with more flour and roll the dough into a long sausage shape and cut with a knife to divide into 16 pieces. Place a piece of the dough cut side down and roll it out to a rough 10 cm circle with a rolling pin. Brush the surface liberally with sesame oil and scatter over the chopped wild garlic. 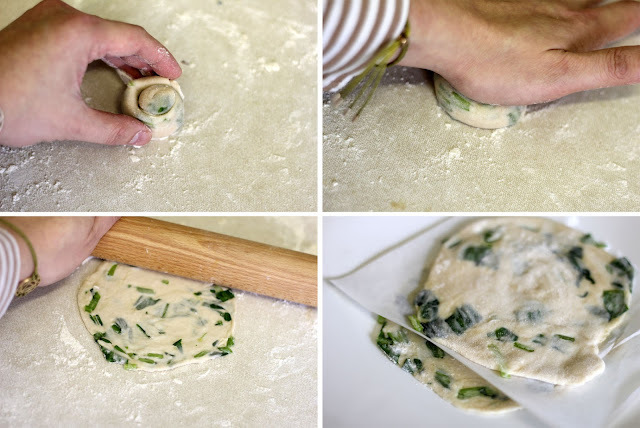 Start rolling the dough to form a sausage, pinch both ends to sealed in the wild garlic and sesame oil. 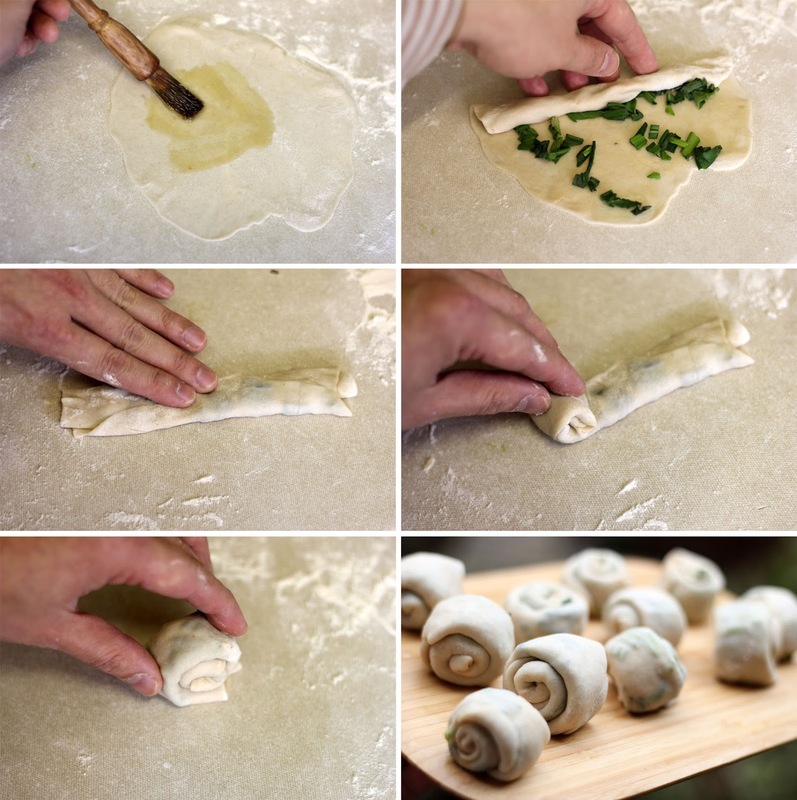 Lightly flatten the roll and then roll it up again from one end like a snail. Press lightly to sealed the end. Set aside while you repeat with the rest. Cover with a clean kitchen towel again and rest for another 20 minutes. Place each roll flat on a lightly floured work surface and press down with the palm of you hand to flatten and roll to a 10 cm circle with a rolling pin. Transfer to a clean plate and repeat with the rest of the rolls. Stack each pancakes between sheets of baking paper to stop them from sticking. Heat a large frying pan over medium heat and brush with some groundnut or sunflower oil. Add 2-3 pancakes at a time. Fry for 2-3 minutes before turning and cook for another 2-3 minutes, until golden brown and crisp. Remove and drain on some kitchen paper. Keep warm in a low oven while you repeat with the rest of the pancakes. These are best serve immediately straight from the pan with the Gochujang dipping sauce. What an amazing recipe! 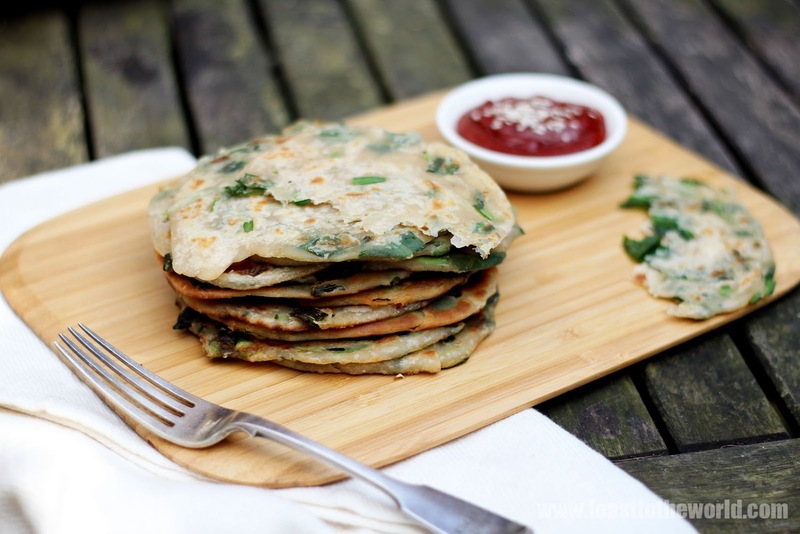 I think my family will enjoy the flavors in this Chinese Wild Garlic Pancakes. Must try them. Glad I found your blog. Will be back for more. Thanks for sharing.